Bury’s latest addition to their extensive car kit range called the Bury CC-9068 App. This is quite similar to the standard CC-9060 car kit which has been a hit for a few years however now your Smartphone becomes the touch screen for the car kit! Along with your phone now being the display the kit has a built in 30w amplifier to allow you to play music from your Smartphone via Bluetooth. 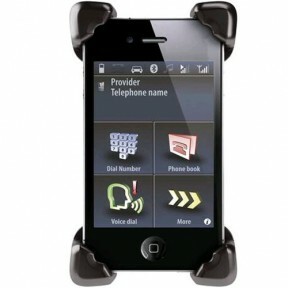 It is supplied with a universal cradle (with antenna) to hold & charge your phone also.